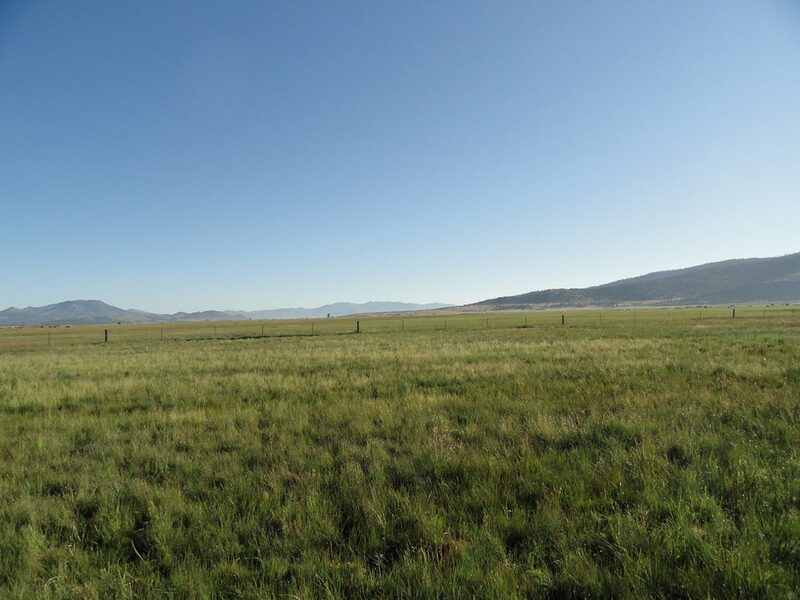 A view of a conservation easement donated to The Nature Conservancy in central Montana. Photo courtesy Dylan DesRosier/TNC. Governments have long acted to protect land from development, sometimes through direct acquisition and other times through land-use regulation. But less centralized, incentive-based approaches are becoming more common across the globe. The U.S. system of preferential tax treatment toward conservation easements held by private land trusts is a leading example of decentralized conservation. In it, the government’s main role is to set tax policy and then let private individuals and organizations, under limited regulation, determine the quantity and patterns of permanent conservation. Easements are a private and voluntary form of land-use zoning. They are legally binding agreements through which landowners give up rights to subdivide and develop rural land but retain rights to farm. The amount of U.S. acreage under easements has expanded from about 1 million acres in 1990 to more than 15 million acres today. This growth far outpaces that of more traditional approaches, such as lands set aside in national and state parks. The growth of easements is enabled by broad support from both the political right and left. Most conservatives prefer land trusts to traditional government-led approaches, and liberals tend to view land trusts as an effective complement to the more traditional government approaches. Because of this broad support, in recent years, federal and state politicians have extended or added tax benefits to those who donate easements, thereby propelling growth. As the use of easements has grown, however, the broad political support may be eroding. Critics have begun to raise questions about the distributional effects of conservation easements as well as their on-the-ground effectiveness. Although millions of acres are under easements, surprisingly little is known about their long-run impacts on land use in aggregate. Do easements actually provide additional conservation? Or do they simply displace development and reward wealthy landowners for actions they would take regardless of whether the land is under easement? What benefits do easements convey to ordinary Americans, many of whom are surprised to learn that most easements do not allow for public access on conserved lands? These questions are relevant to public policy because the public is invested in the success of conservation easements. Although many easements are donated to land trusts, the donation is in exchange for tax breaks that U.S. taxpayers implicitly fund through foregone claims to tax revenue. Yet evaluating the public’s return on easement investments is difficult because some of the activity is not transparent. For example, land trusts have not been required to report (or learn) the tax deductions claimed by donors, so information on the cost of easements is not readily accessible. 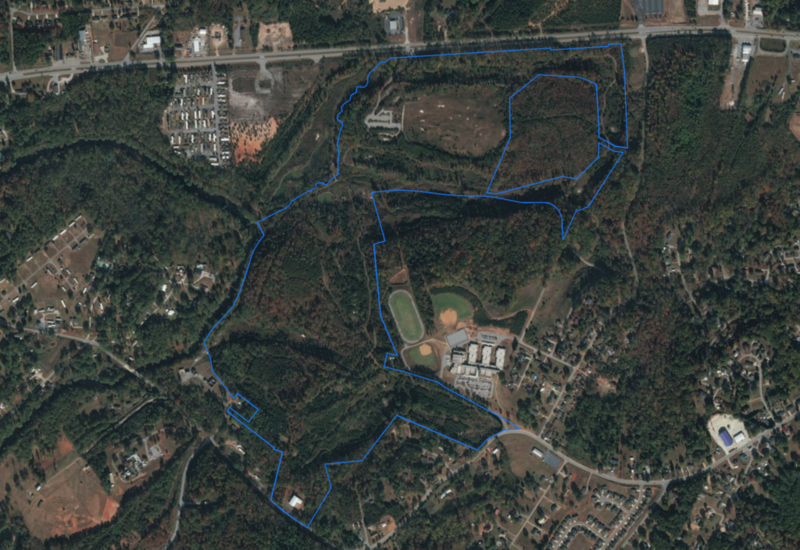 A closed golf course outside of Greenville, South Carolina, sat vacant for a decade before new investors placed 185 acres of the property under a conservation easement. Imagery from the National Conservation Easement Database. The public does know the ranks of easement donors includes wealthy Americans. According to Wall Street Journal reports, some of the highest-valued easements cover golf courses owned by Donald Trump. Large easements have also been donated by moguls such as Ted Turner and Tom Brokaw, to name a few. The average easement donation was $475,416 over 2003-12, which dwarfs in value every other form of charitable giving on a per-donation basis, including art, real estate, and money. IRS summary data show that while 2 percent of easements came from taxpayers with annual incomes greater than $10 million, these donors accounted for 23 percent of the monetary value. Taxpayers with incomes exceeding $500,000—roughly the top 1 percent—accounted from 17 percent of donation quantity but 75 percent of monetary value. Roughly 63 percent of easement donations came from taxpayers earning less than $200,000 in 2012. These statistics indicate that wealthy donors dominate in terms of deductible value, but also that the majority of donors have relatively modest incomes. Do wealthy donors dominate because they are more generous, or because they pay a lower donation “price”? To shed light on this question, I have developed a “conservation tax calculator” with collaborator Walter Thurman. Conditional on a taxpayer’s income, state of residence, and the year and value of a donation, the calculator estimates an after-tax donation price. This price incorporates federal and state income tax rates, rules about charitable deductions, and state tax credit programs. It also accounts for the dynamic effects of carryover provisions and annual income limits on easement deductions. Figure 1 shows the price over 1987-2012 for an easement donated in the seven states without an income tax. Focusing on these states isolates and highlights the role of federal income tax policy. Each panel plots the price for four different taxpayers: those with adjusted gross incomes of $100,000, $200,000, $350,000, and $1 million. Panels A and B show calculator output for easements appraised at $500,000 and $1 million, respectively. Notes: The legend is as follows. AGI $100,000 is the red solid line. AGI $200,000 is the black dotted line. AGI $350,000 is the blue long dash-dotted line. AGI $1,000,000 is the green dashed line. We assume the AGI $100,000 and AGI $200,000 donors are qualified farmers and the higher AGI donors are not. All scenarios assume that none of the donation’s value would otherwise be subjected to capital gains taxation. (If it was subjected to capital gains taxation, the after-tax price would be lower). The prices demonstrate the combined effects of differences in marginal tax rates and of AGI limitations on deductions and carry-forward limits. Prior to 2006, the price increased with donation size primarily because of a five-year carry-forward limit on charitable deductions. Because of the AGI limits and the carry-forward constraints, a taxpayer with an AGI of $100,000 could deduct only $30,000 (0.30 x $100,000) each year for six years, leading to a total deduction of $180,000. Moreover, deductions in later years yield declining financial benefits due to the 5 percent annual discount rate we apply to the calculations. The price falls for the lower income donors in 2006 because the carry-forward period was extended from five to 15 years. The AGI limitation was also increased in 2006 from 30 to 50 percent for all donors and from 30 to 100 percent for qualifying farms and forests. Hence, a qualifying landowner with an AGI of $100,000 would fully exploit the $500,000 donation in 5 years, which lowers the price of conservation from 0.94 to 0.89 cents in terms of the after-tax cost of each dollar of value donated. For better or worse, market forces are starting to channel easement tax breaks to taxpayers who can fully exploit—and perhaps “over-exploit”—the tax incentives. Consider the recent rise of so-called syndicated easements. The deals involve groups of investors forming partnerships that buy land with the intent of donating easements for financial gain. 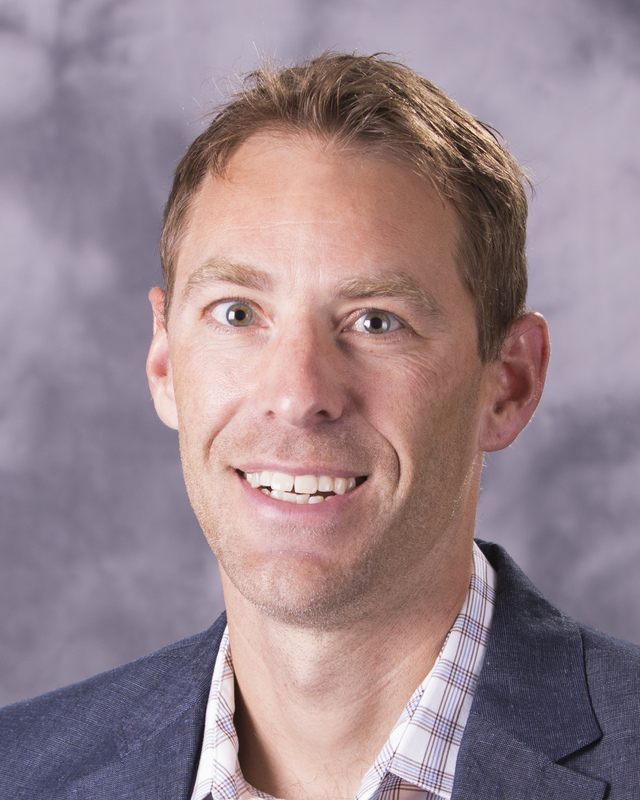 These arrangements enable full tax-benefit exploitation because, with a large number of partners, each partner can claim the tax benefit without hitting the 50 percent of AGI tax constraint. Hence, full tax sheltering is one economic rationale for the emergence of syndicates. Another rationale is that syndicated easements are attractive to investors primarily because the deal brokers have access to appraisers who are willing to exaggerate donated values; this is the issue of focus by Adam Looney of the Brookings Institution and described in media outlets. Through their support of easements, federal and state tax codes encourage “dead hand control” of land because they require restrictions to be permanent and, unlike other forms of donation, are not subject to reversal. 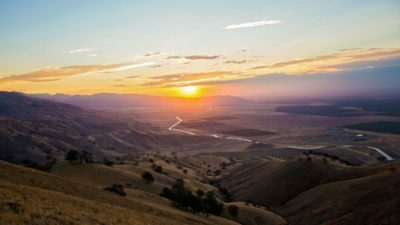 This requirement is lauded by many environmentalists and land trusts, but it is inconsistent with centuries of common law, which tends to discourage perpetual constraints on land use. One reason is that restrictions that freeze land use to a landowner’s present desires may become antiquated and inefficient over time. Freezing future land uses to the desires of wealthy land barons also raises distributional concerns. Such restrictions could exacerbate inequality in land ownership over time by preventing subdivision into parcels that would be affordable for middle-class Americans. A More Equitable (and Effective) Public Financing Mechanism? Elsewhere I have argued that relying on tax incentives may encourage ad hoc patterns of conservation that are expensive and ineffective in aggregate. This is because the tax-code funding vehicle puts donating landowners in the driver’s seat and weakens the ability (and incentives) of land trusts to use taxpayer dollars in ways that best serve the public’s interest. Specifically, I have asked if land trusts could successfully self govern, for example, through Land Trust Alliance (LTA) accreditation, or if the movement would benefit from top-down federal regulation. The continued growth of easements in general, and the rise of syndicated easements in particular, has put these same questions back in the spotlight. What kinds of reforms are needed? Can Land Trust Alliance accreditation alone weed out rogue land trusts that seek only to maximize tax breaks? Should the IRS cap the size of easement deductions? Such a cap on the size of donations is proposed in the Charitable Conservation Easement Program Integrity Act of 2018. From my perspective as an economist, this proposed policy and others focused on IRS oversight would not remedy the fundamental incentive problem with donated easements. Because land trusts accepting donations do not use their own money, they are not fully incentivized to carefully compare the costs and benefits of conserving a proposed donation to alternative acquisitions. This is a reason why donated easements tend to be of inferior quality when compared to land that is purchased by land trusts. A conservation easement supported by Walmart’s Acres for America program at Jameson Ranch in California’s Sierra Valley. Photo Courtesy Walmart Corporate. In previous work, I contemplated an alternative public funding mechanism that could fix the incentive problem. Federal tax code funding for easements could be replaced by an equivalent level of funding through federal competitive grants requiring trusts to raise matching funds from private sources and local governments. This may seem like a radical step, but the potential benefits to the general taxpayer, who is already paying for easements, are worth considering. First, the alternative scheme would allocate federal dollars to areas about which there is some consensus that the value of conservation is particularly high. Supporters of the trust would pay the most and therefore guide the decision; proposals could also be evaluated by land conservation experts. This process is in contrast to the current situation where a local landowner (including partnership syndicates) who has an interest in donating an easement triggers the process. Second, once trusts received grant monies, they would have a budget constraint that would encourage them to act as if they bore the full costs of acquiring different parcels. Currently, the source of forgone tax revenue is virtually limitless, as long as the trust can find willing landowners. In contrast, fixed allocations of grant dollars would encourage trusts to prioritize. A third and related advantage is that land trusts would have stronger incentives to oversee the appraisal of easements. Land trusts receiving federal grants would be using money from their own budget to buy easements, so they would be motivated to question appraisals that seem unreasonably high. More generally, instead of seeking easement donors from a small pool of parties motivated by tax incentives, land trusts would have a public funding source that allowed them to negotiate with a larger pool of potential easement sellers. The key to both alternative funding vehicles—competitive grants or allocable credits—is that each would empower land trusts with more discretion (and funding), thereby putting them in the driver’s seat. Ideally, land trusts would then prioritize lands for acquisition based on inherent conservation value and acquisition cost, independent of the owner’s wealth or motives. Unlike the current system under tax code funding, land trusts would not need to prioritize their efforts based the degree to which the land’s owner is incentivized to donate, which depends on landowner income and creativity in exploiting tax advantages. To be sure, either funding reform would introduce new challenges and problems not considered here. 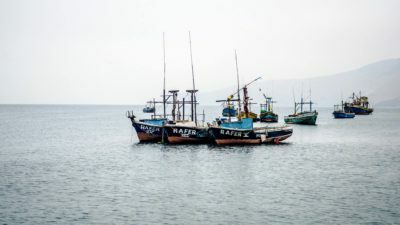 The benefit, however, is that each reform could delink conservation from tax considerations that may not align with cost-effective conservation. This piece is from Distributional Effects of Environmental Markets: Insights and Solutions from Economics, a PERC Policy Report edited by senior fellow Christopher Costello. The volume features work from world-class researchers and practitioners who shed light on the ways in which environmental markets could be better designed and implemented to account for distributional concerns. 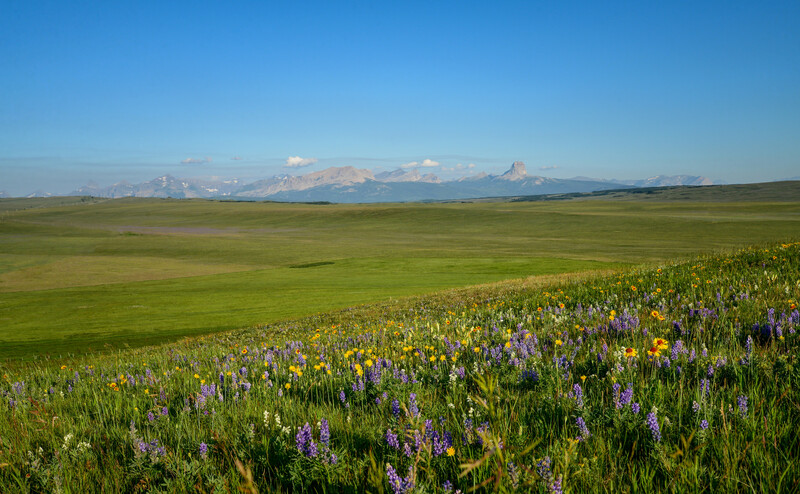 Read a response to Parker’s article on conservation easements, by Director of Land Protection at The Nature Conservancy Mike Conner, here. Read the full volume here. 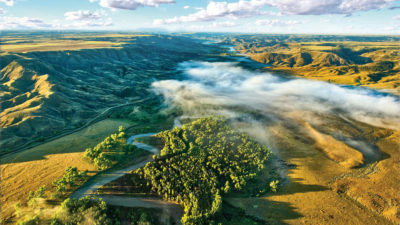 Easements enable conservationists to buy and retire other rights from landowners—for example, the right to mine and log—and can be customized on a case-by-case basis. According to Looney (2017), some land trusts voluntarily disclose the value of the donations they receive, but most do not. See, for example, Rubin, R. (2017) “When a Conservation Tax Break Protects Backyards and Golf Courses.” Wall Street Journal, June 1. 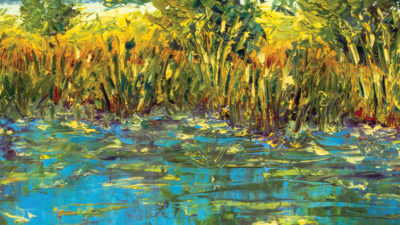 During the 2000s, the average value of a donation was $163,000 for land, $45,000 for stocks and other financial gifts, $37,000 for intellectual property, and $7,000 for art (Eagle 2011). The tax credits in some states, such as Colorado and New Mexico, are tradable. Making credits tradable shrinks the gap in donation price between high and low income donors because cash-poor but land-rich owners can sell tax credits to higher-income taxpayers who can fully exploit the tax benefits. Quoting the article: “The IRS has policing power, and it wields that clout chiefly by auditing the returns of those who take the deductions. But that’s a torturously slow process and one that so far has yielded minimal results. The speed at which [alleged tax abuses of easements] have increased has left the resource-starved agency looking like a befuddled mall cop lurching off his chair and trying to figure out which of the dozen teenagers simultaneously grabbing candy bars to chase down.” See Elkind, P. (2017) “The Billion-Dollar Loophole.” Fortune Magazine, Dec. 20. Judged on the narrower criterion of effective conservation (rather than social efficiency), it is also not obvious that perpetual constraints on land use is good policy. As economic and ecological conditions change, the benefits and costs of conserving different parcels will change. 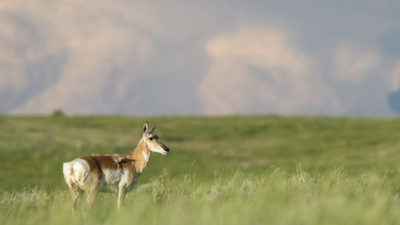 It is doubtful that every easement currently held by land trusts will continue to yield conservation benefits in the face of population growth and migration, changing demands on agricultural land, climate change, and changes in preferences toward the preservation of different wildlife species. Eagle, Josh. 2011. 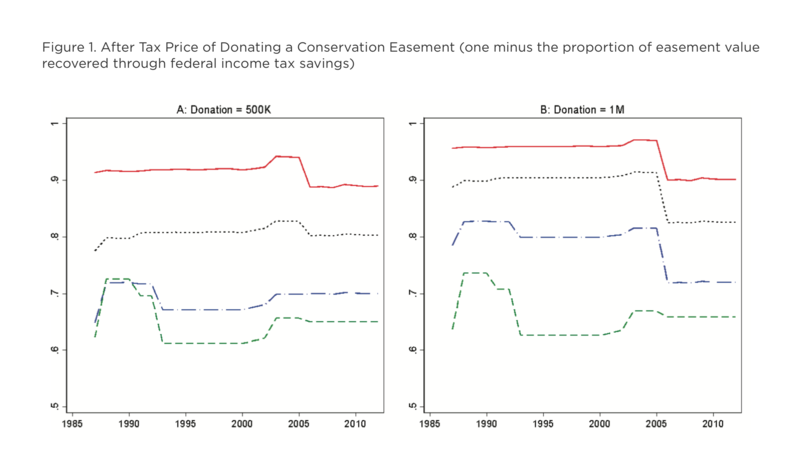 Notional Generosity: Explaining Charitable Donors’ High Willingness to Part with Conservation Easements. Harvard Environmental Law Review 35: 47-90. Looney, Adam. 2017. Charitable Contributions of Conservation Easements. The Brookings Institution. Mahoney, Julia D. 2002. Perpetual Restrictions on Land and the Problem of the Future. Virginia Law Review 88(4): 739-787. McLaughlin, Nancy A. 2005. Rethinking the Perpetual Nature of Conservation Easements. 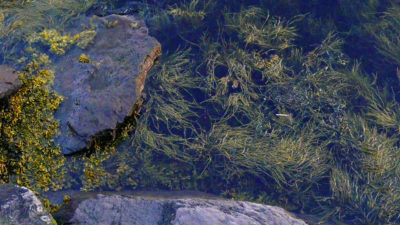 Harvard Environmental Law Review 29: 421 -521. Parker, Dominic P. 2005. Conservation Easements: A Closer Look at Federal Tax Policy. PERC Policy Series No. PS-34.